Most of us are familiar with brainstorming—a method by which a group generates as many ideas around a topic as possible in a limited amount of time. 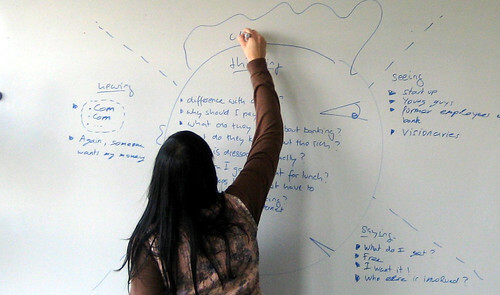 Brainstorming works to get a high quantity of information on the table. But it begs the follow-up question of how to gather meaning from all the data. Using a simple Affinity Diagram technique can help us discover embedded patterns (and sometimes break old patterns) of thinking by sorting and clustering language-based information into relationships. It can also give us a sense of where most people’s thinking is focused. Use an affinity diagram when you want to find categories and meta-categories within a cluster of ideas and when you want to see which ideas are most common within the group. 1. 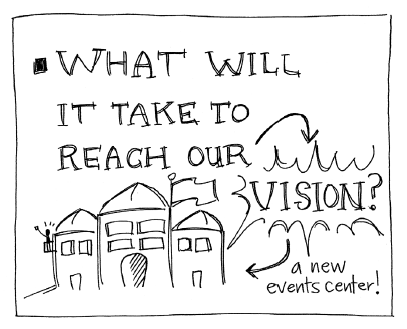 On a sheet of flip-chart paper, write a question the players will respond to along with a visual that complements it. Conduct this game only when you have a question for the players that you know will generate at least 20 pieces of information to sort. 2. Ask each player to take 10 minutes to generate sticky notes in response to the question. Use index cards on a table if you have a group of four or less. Conduct this part of the process silently. 3. Collect the ideas from the group and post them on a flat working surface visible to everyone. It should end up resembling the following figure. 4. Based on guidance from the players, sort the ideas into columns (or clusters) based on relationships. Involve the group in the process as much as possible. Have the players approach the wall to post their notes—it saves time—and allow them to do an initial, general sorting in columns or clusters. 5. 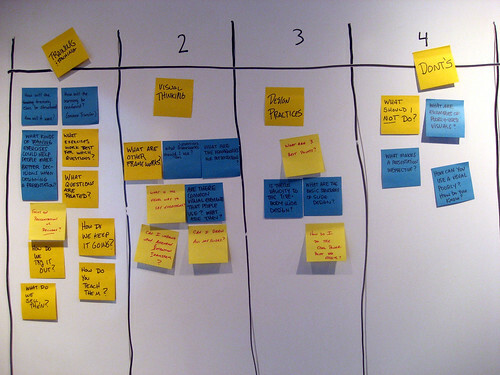 Create a sticky-note “parking lot” close to the display for ideas that don’t appear to fall into a natural category. 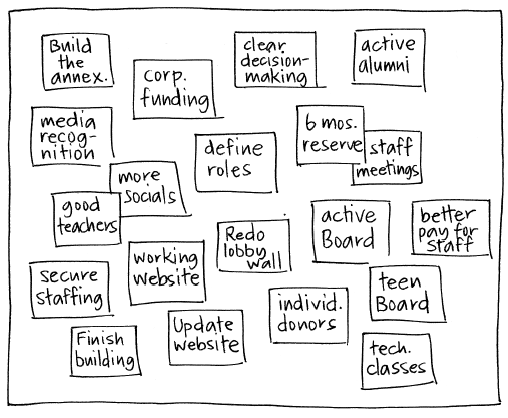 Redundancy in ideas is OK; don’t discard sticky notes because they’re already represented. It’s helpful to leave repeated ideas posted since it indicates to the group how many people are thinking the same thing. At this stage, ask the players to try to avoid searching for higher categories and simply to focus on grouping the information based on the affinities. 6. Once the content is sorted, ask the group to suggest categories that represent the columns you’ve created and write the categories they agree on at the top of the column (or near a cluster if you chose a cluster rather than a column display). Don’t let the players spend an inordinate amount of time agreeing on a name for a category. If there’s disagreement over “Facilities” versus “Infrastructure,” write them both. If the players produce categories that are significantly different, pay attention to which category gets the most approval from the group and write that one. Your visual may end up looking like the one below. The value of the Affinity Diagram game increases when two conditions are met. The first is that the players generate multiple data points, ideally with good information. The second relates to the quality of the sorting. The cleaner the players’ insights when they form relationships within the content, the better the categories will be. notes and recombine the ideas based on affinities they didn’t notice in the first round. Sometimes affinities within content are crystal clear, so the sorting becomes less pivotal, but when those relationships are more nuanced, it’s more important that the sorting process is done well. In a situation in which there are many ways to affinitize information, assume a stronger facilitative role. Ask questions about the columns or clusters to clarify the group’s thinking and steer them toward an appropriate number of categories. If there are too many, the data gets watered down. If there are too few, the analysis gets watered down. Help the players find the sweet spot. The affinity diagram was devised by Jiro Kawakita in the 1960s. It is also referred to as the KJ Method. Every meeting deserves a plan. Note that a great plan can’t guarantee a great outcome, but it will help lay down the fundamentals from which you can adapt. Sketch out these fundamentals by using the 7Ps framework. Use these items as a checklist. When preparing for a meeting, thinking through the 7Ps can improve focus and results, even if you have only a few moments to reflect on them. on, and what’s on fire? If this is difficult to articulate, ask yourself if a meeting is really necessary. Product: What specific artifact will we produce out of the meeting? What will it do, and how will it support the purpose? If your meetings seem to be “all talk and no follow-through,” consider how a product might change things. we answering with this meeting? Who are the right people to answer the questions? attendees. 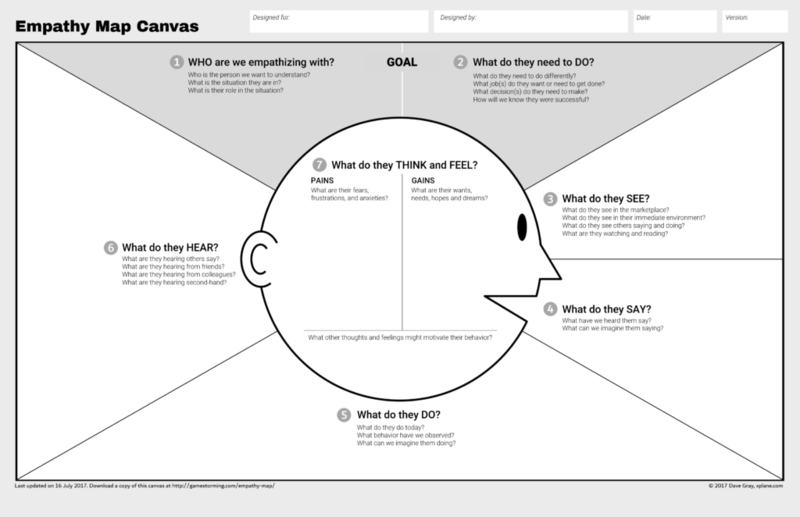 Co-design an agenda with them to ensure that they will show up and stay engaged. designated as out of scope. Prep: What would be useful to do in advance? This could be material to read in advance, research to conduct, or “homework” to assign to the attendees. Practical Concerns: These are the logistics of the meeting—the where and when, and importantly, who’s bringing lunch. Each of the 7Ps can influence or change one of the others, and developing a good plan will take this into account. For instance, if you have certain participants for only part of a meeting, this will change your process. Get others involved in the design of the meeting. Their participation in its design is the quickest route to its effectiveness. Recurring meetings can take on a life of their own and stray from their original purpose. It’s a healthy activity to revisit “Why are we having this meeting?” regularly for such events. Make the 7Ps visible during the meeting. These reference points can help focus and refocus a group as needed. Have a plan and expect it to change. 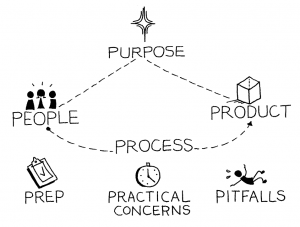 The 7Ps can give you a framework for designing a meeting, but they can’t run the meeting for you. The unexpected will happen, and as a leader you will need to adapt. 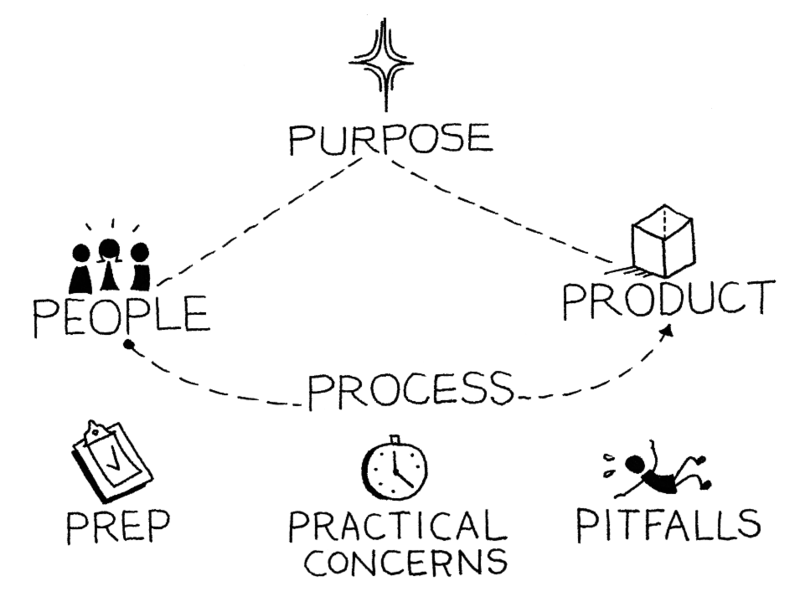 The 7Ps Framework was designed by James Macanufo.